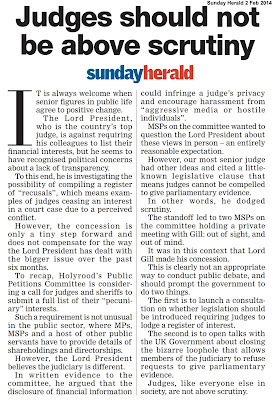 In reality, proposals to transform Scotland’s Courts will have little real effect on access to justice. 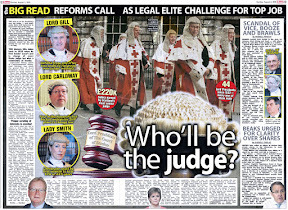 THE LATEST plans to transform Scotland’s antiquated, prejudiced & famously ‘closed-shop-to-all-but-lawyers’ courts & justice system are now upon us in the form of the Scottish Government’s Courts Reform Consultation, coming somewhat desperately a whole four years after Lord Gill, now Scotland’s top judge, branded the Civil justice system as “Victorian” and “failing society”. 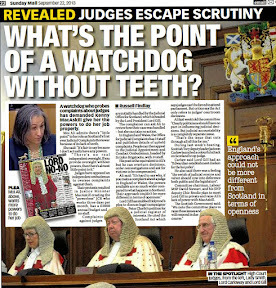 The plans are presented as a sweeping sea change to the speed of justice in Scotland, like so many earlier proposals which have led to the current daily chaos of Scotland’s courts where cases can languish for decades without a result. 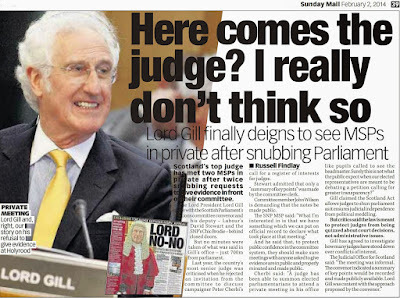 The Courts Reform Bill as it is being presented follows Lord Gill’s earlier criticisms, stating that Civil courts are vital to the effective functioning of a civil justice system. 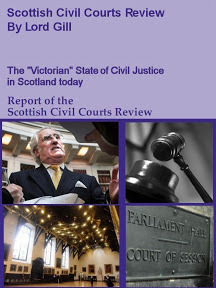 However, the structure of the civil courts in Scotland is still largely based on a Victorian model. 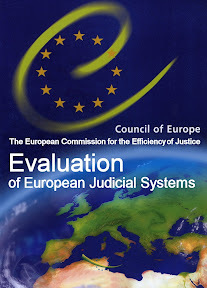 Because of that, and the massive social and legal changes which have taken place over the last century, the structure is now under a considerable degree of strain: too much business is taken up in higher courts - particularly the Court of Session - which could be more appropriately dealt with by lower courts; cases need to be better monitored and managed; the civil procedure rules urgently need modernised and made more accessible to the citizen; and there needs to be far greater flexibility in the ways actions can be brought and funded. 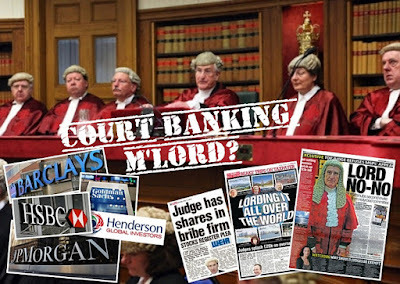 However, and in keeping with any in-house driven “reform” of a justice system notoriously dominated by the vested interests of a money making legal profession who regularly overcharge clients and prolong legal actions in court for no other purpose than making money, the plans may well end up as so many other ‘reforms’ to the justice system have ended up – putting money into the pockets of lawyers while clients and consumers not able to afford justice, lose out. 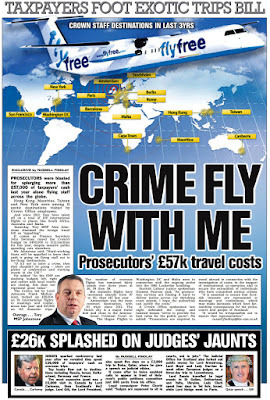 * Increasing the threshold under which only the Sheriff Court can deal with civil cases from £5,000 to £150,000 so that more can be dealt with locally - freeing up the Court of Session to deal with the most complex disputes. * The creation of a new judicial post – the summary sheriff – to hear lower value civil cases and less complex criminal cases. These sheriffs will have expertise in such casework and, in many cases, will use a new simpler procedure to resolve disputes fairly, swiftly and efficiently. 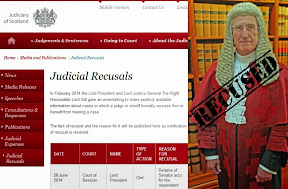 * The creation of a Sheriff Appeal Court to deal with civil appeals and less serious criminal appeals. 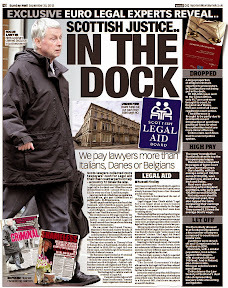 * The creation of a national personal injury sheriff court as a centre of expertise. * Improvements to judicial review procedure, including introducing a three-month time limit for applications to be brought. Mr MacAskill could only rely on supporting comments from a solicitor, and the Association of British Insurers, both of whom predictably welcomed the Scottish Government’s proposals. 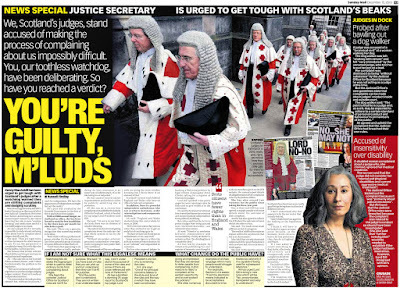 However, a representative from one of Scotland's consumer bodies told Diary of Injustice she felt the proposals were little more than “an update to a profitable business model for lawyers” and are a far cry from what is actually needed to give Scots consumers a more fair, less expensive & direct route to access the courts & justice system. A court user who is currently stuck in a years long battle in the Court of Session was also critical of the plans, pointing out there is nothing in the bill to encourage more honesty on the part of law firms who take on legal cases just to “drum up business and fees no one can really afford”. 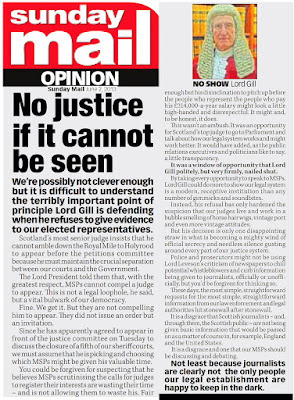 Cutting through the Justice Minister’s incredulous claims on the subject, what we are actually talking about in these reforms is, simply, creating new business markets for lawyers and the legal profession rather than giving the Scots public direct access to justice. 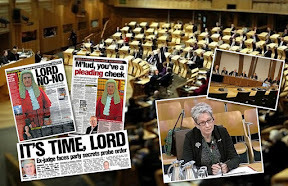 If, for instance, you are a party litigant, either through circumstances of not being able to afford the daft rates charged by Scots law firms for poor legal work with little chance of success, or perhaps you find yourself on the legal profession’s boycott list, these latest proposals from the Scottish Government will do little to give you increased access to the courts. 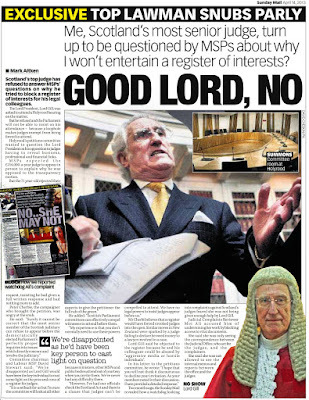 So, again, those vested interests in the courts system, in the form of solicitors & law firms, will as usual gain the most as in ramping up legal business on the back of feeding clients glorious tales of securing them massive settlements in ‘quick’ legal actions which actually will end up taking years to proceed to court at the usual vast expense to clients, and will simply clog up the Sheriff Courts instead of the Court of Session. 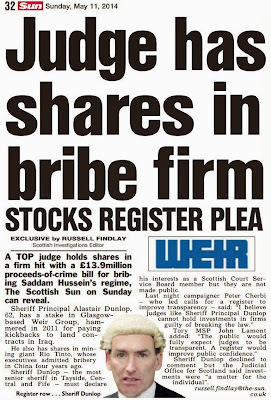 It is also of interest to note the plans put forward by the Scottish Government of creating a new judicial tier as well as effectively localising many more claims in local court cases will inevitably bring dangers where the currently undeclared interests of the judiciary may well begin to conflict with claimants cases being heard in Sheriff Courts. 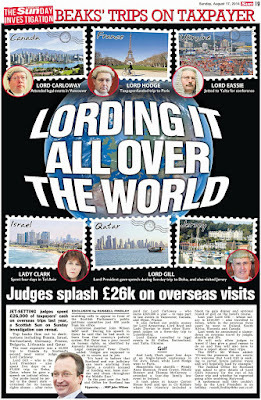 The pitfalls of localising claims to local courts may begin to affect personal injury or damages claims, where for instance, undeclared links between members of the judiciary, their families and local professions, industries & public bodies who are subject to legal actions, will end up resulting in cases not be heard on a fair basis, for example, where a litigant may be suing a health board, law firm or other defender which has a connection to a member of the judiciary or someone in the local court staff rolls. 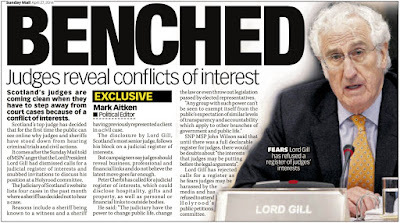 Such problems of conflict of interest are not resolved in the Scottish Government’s Courts Reform Bill, given the fact the same Lord President who once called Scotland’s justice system as “Victorian” has vehemently rejected a need for a register of interests as has been proposed to the Scottish Parliament here : Petition PE01458: Register of Interests for members of Scotland's judiciary. 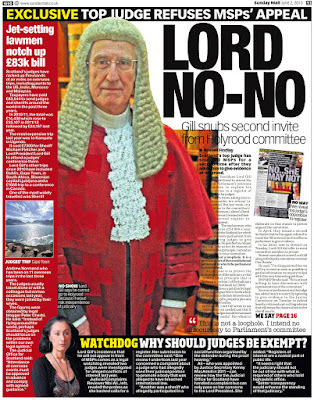 New £313-a-day Chair for Scottish Legal Complaints Commission. 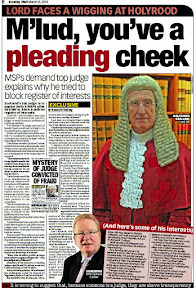 THE widely disrespected Scottish Legal Complaints Commission (SLCC), the ‘single gateway’ for all complaints made by clients against Scottish solicitors, has a new Chair with the announcement of the appointment of Bill Brackenridge, who takes over the £313 a day position of what many observers now accept is little more than a “front company” for the Law Society of Scotland. 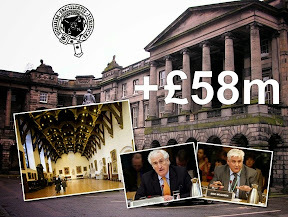 Mr Brackenridge claims the SLCC, with its annual budget of nearly £3 million pounds, paid for by client fees to solicitors, will be made more effective in dealing with complaints and will encourage improved standards in the legal profession under his leadership. 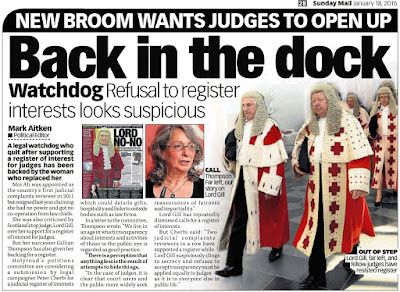 Mr Brackenridge replaces Jane Irvine, the SLCC’s first Chair,and former Scottish Legal Services Ombudsman, who retired from her position on 31 December 2012. The SLCC announced the appointment of Mr Brackenridge last week in a low key Press Release. The SLCC said Mr Brackenridge will bring “considerable Corporate Governance experience to the SLCC”, on the basis that as a management consultant for 25 years he has extensively advised public and private sector clients. Among his former appointments, Bill Brackenridge has served as a non-Executive Director on Highlands and Islands Airports Ltd and on NHS Highland, chairing the Argyll & Bute CHP for five years. 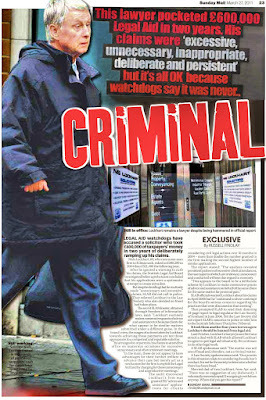 For six years he chaired the Board of the Scottish Ambulance Service. He comes to the SLCC aiming to build on its formative years and intent upon developing positive relationships with its stakeholders. Mr Brackenridge said : "I'm pleased to be joining the SLCC at such an important time in its development. We're now established as the gateway for all legal complaints in Scotland but there's much more for us to do to build trust and confidence in legal services. I'm looking forward to working with the team to make us even more effective and influential in dealing with complaints and in encouraging improved standards through our powers of guidance and oversight. The legal market is changing. Our hard-won experience will contribute to maintaining and strengthening public trust and confidence in buying and using legal services." 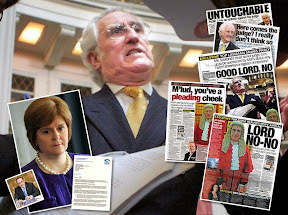 Omitted from the SLCC’s Press Statement, it is also known Mr Brackenridge was appointed by Deputy First Minister Nicola Sturgeon to the Vale of Leven Monitoring Group which was set up to advise NHS Greater Glasgow & Clyde on the future of the Vale of Leven Hospital in West Dunbartonshire and modernisation of health services at the hospital. 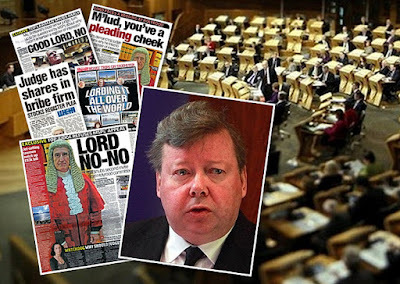 However, during Mr Brackenridge’s tenure at the Vale of Leven Monitoring Group, it is worth noting and perhaps of considerable concern, that eleven lay members from the Vale of Leven Monitoring Group resigned their positions in a mass resignation, claiming their views were being ignored by the health board after a number of decisions were apparently taken by the Health Board contrary to input from the group’s lay members. 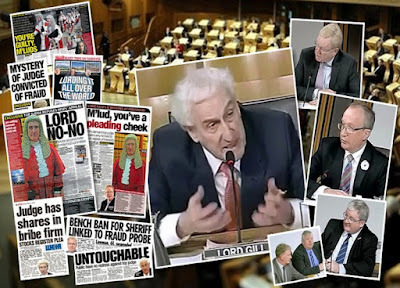 At the time of the mass resignation by the lay members, Mr Brackenridge in his capacity as Chair, told a meeting of the Vale of Leven Monitoring Group he was "disappointed" by the resignation of 11 lay members. 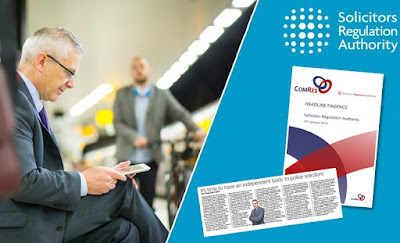 However, the incident was widely reported in the media, with opposition politicians calling for Mr Brackenridge’s group’s disbandment, on the basis it had “no credibility”. 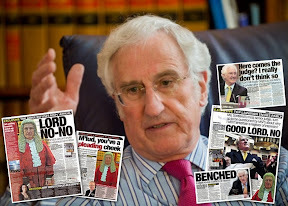 It may well be worth noting that Mr Brackenridge now finds himself heading a legal complaints regulator also well known for its lack of credibility. 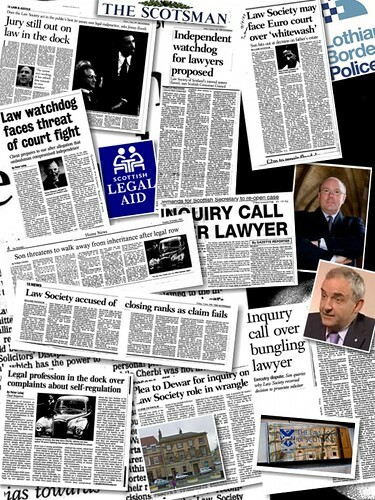 However, some cases brought to the attention of Diary of Injustice appear to show the SLCC has told some clients it may be up to EIGHT MONTHS before their complaint is assigned to an investigator, while other cases have shown the SLCC is refusing to consider any evidence submitted by clients to challenge spurious claims made by solicitors who have the backing of organisations such as the Legal Defence Union to ‘persuade’ the SLCC to drop cases “on demand” as one insider put it. 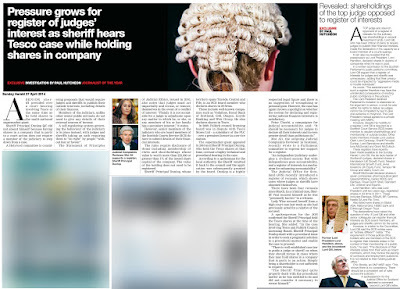 Lawyers look after their own as ‘independent’ regulator rates Law Society. 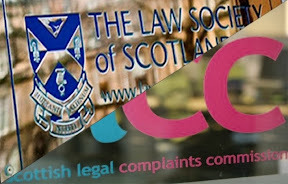 CONDUCT COMPLAINTS against Scottish Solicitors, like all complaints about poor legal services provided by Scotland’s legal profession, are, according to a report released by the ‘independent’ Scottish Legal Complaints Commission (SLCC), ‘reasonably’ handled by the Law Society of Scotland, even though the entire complaints process lacks any transparency and clients are left facing lengthy delays of up to a year before the Law Society may eventually reach a conclusion. 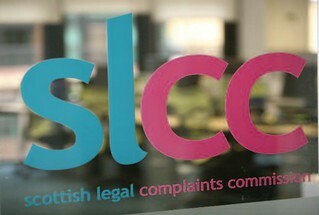 The SLCC’s Review of the Law Society of Scotland's timescales in relation to conduct complaints handling, carried out in November 2012 and only recently published states concludes that the SLCC Board could take 'reasonable assurance' in the Law Society's overall complaints handling system but recognised that the processes, procedures and controls under review could benefit from a number of improvements. Findings in the SLCC report stated : It was identified that there were no formally approved documented timescales or targets in place for investigating complaints under Law Society’s seven-stage complaint investigation process under the 2007 Act. In addition there were no formal timescales/targets in place to effectively measure the progress of a complaint through the Law Society‟s seven-stage conduct handling process. However, we note that there are now some targets set out in the Complaints Investigator Manual (Conduct Complaints) which was approved by the Client Care Sub Committee in April 2012. These targets include timescales for dealing with correspondence,telephone calls and update letters. A quarterly report of “Regulation-Conduct Complaints‟ is produced for the Board tracking progress against key indicators. A copy of the report from November 2011 to end of January2012 indicated that the average number of days to process and conclude a complaint was 320 days. Our manual calculation identified a discrepancy (349 days) in the average number of days to process and conclude a complaint. We were informed that the average number of days is calculated automatically from Visual Files and is not manually verified prior to reporting to the Board. The SLCC obtained a sample of 30 complaints covering the period of 01 October 2008 up to the planning phase of the Audit. The sample consisted wholly of closed cases which had reached the Closure stage. We identified those cases which exceeded the target of 320 days and split these into each individual stage of the seven stage complaint handling process. Where complaints exceeded the average timescale, these were further investigated to identify at what stage(s) delays had occurred. From this we identified that the majority of delays/lengthy timescales in the process were within the Ingathering Evidence and Reporting Stages. 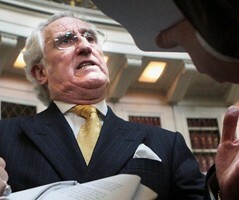 * non co-operation of the solicitors complained of leading to the issue of Section 48 Notices. The SLCC found instances where parties were not kept informed when their case was being transferred from one Complaints Investigator to another, or where the Complaints Investigator was going to be absent for a period of time, e.g. annual leave. Lastly, we identified instances where there were large periods of inactivity in the complaint file, which could not be readily explained. The SLCC recommended that the Law Society keeps the SLCC updated on the IT Visual File project and notifies the SLCC of any timescales which are set. The SLCC also recommended that once timescales have been set, a process is developed to monitor timescales and targets to ensure these are met. These should be periodically reviewed to ensure that they accurately reflect the complaint handling process. The SLCC also recommended the Law Society’s Regulation office should consider regularly publishing timescale targets on the website to ensure transparency. It should consider publishing a summary of the numbers, business category of complaints received and the timescales in which they were resolved. 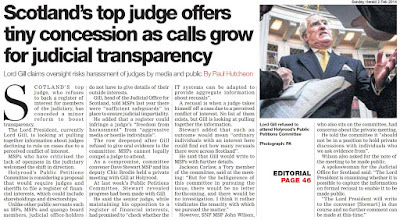 It should be noted many of the SLCC’s findings could just have easily been made every year over the past two decades as the Law Society of Scotland’s Complaints Department have consistently treated client complaints with year long delays, a lack of transparency and record levels of prejudice, proving that in 2013, little has changed with regard to regulation of Scotland's legal profession with clients & consumers getting a raw deal from poorly regulated solicitors who look after their own. 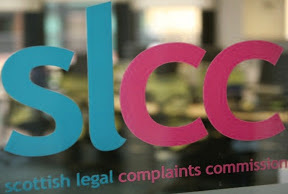 While no Press Release has been issued by the Law Society of Scotland, the SLCC said on their website the Law Society has accepted the overall finding of 'reasonable assurance' and has provided a detailed response as to what actions have been undertaken since the audit was performed and other actions that are in the pipeline. The SLCC went onto claim the Society will be monitored by the SLCC in terms of its on-going oversight role and some will form the subject of future reviews/follow-up work. Lawyers survey boycott & unverifiable data ruins complaints research. 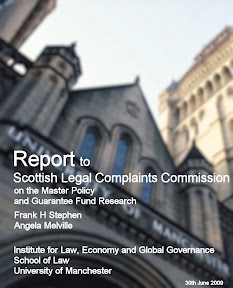 COSTLY RESEARCH undertaken by the Scottish Legal Complaints Commission (SLCC) into how lawyers & advocates ‘handle’ complaints from their clients has today been labelled “an expensive failure & time wasting exercise” after results revealed a staggering 75% of all Scottish law firms & advocates either “refused”, were “not available” or “terminated” their participation in the research which sought disclosure of key details on how complaints from dissatisfied clients are handled made to them before clients are forced to approach regulators such as the SLCC or Law Society of Scotland. 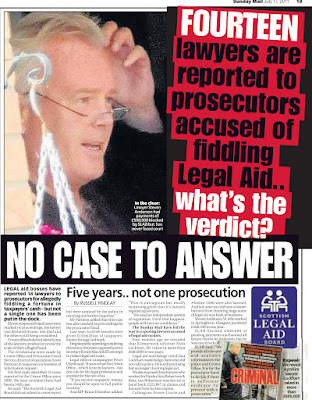 And while the lack of participation effectively rendered the ‘independent’ SLCC’s research unusable, insiders at the regulator now also believe many law firms fiddled the numbers and simply LIED in what little data was actually handed over by the legal profession, as none of what was submitted can be independently verified or subject to public inspection. Figures released in the two reports published by the SLCC show that of the total numbers of questionnaires & letters sent out to every law firm & advocate in Scotland by research firm TNS-BMRB who were commissioned by the SLCC to carry out the research, 850 law firms and 350 advocates either refused or for a variety of other reasons, failed to disclose any details on how complaints made by dissatisfied clients are handled. 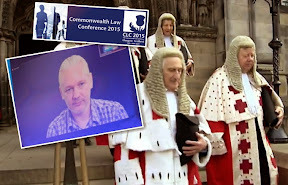 Later that same day (31st January) after the documentation was released to Diary of Injustice journalists, the SLCC issued a press release with a short comment from Richard Keen, the Dean of the Faculty of Advocates. There has so far been no comment from the Law Society of Scotland on the survey or the lack of participation of its members. 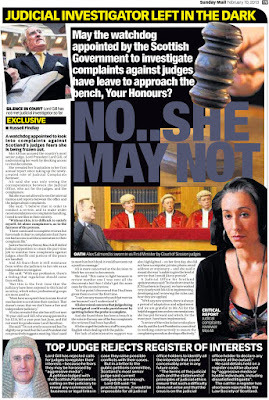 The mass non-participation of Scotland’s legal profession in the ‘independent’ regulator’s complaints survey comes as no surprise after Diary of Injustice earlier reported on calls by various sections of Scotland’s legal profession to boycott the survey after lawyers groups such as the Scottish Law Agents Society (SLAS) voiced fears that any information handed over to the SLCC would be released to the media via Freedom of Information Requests. 4. To establish the outcome and disposal of complaints. The SLCC claimed that the research, the first of its kind in Scotland, was intended as an initial fact-finding exercise. As such, it has highlighted scope for further work which the SLCC will undertake as part of its on-going oversight role. 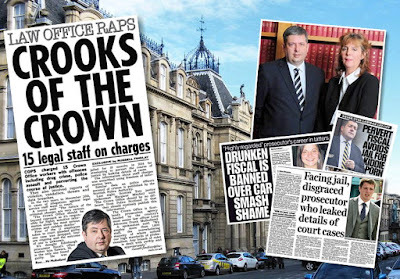 However, the information which made it into the research and the conclusions of both reports unsurprisingly reveal complaints records within the Scottish legal profession are at best, a mess. More worryingly, if unsurprisingly, analysis of the reports by consumer campaigners reveal a deliberate act of deception on the part of lawyers to avoid accurate reporting of client dissatisfaction with Scottish solicitors & law firms, now rated as among the worst & most expensive in the entire European Union. 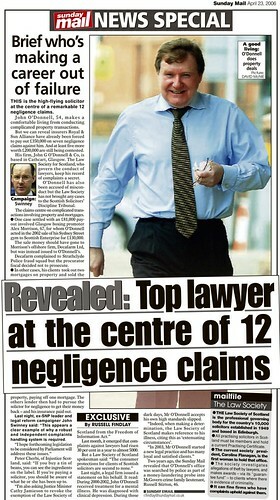 Critics who have viewed & studied both the report into law firms & advocates have raised serious doubts over the accuracy of information handed over to the research firm by Scottish lawyers & advocates, highlighting the fact there is absolutely no way to authenticate any of the data handed over to the researchers in interviews or questionnaires. The SLCC refused to answer questions on the low participation rate of the survey and offered no comment on the legal profession’s call to boycott the SLCC’s research, which will be met out of its 2011-2012 budget. 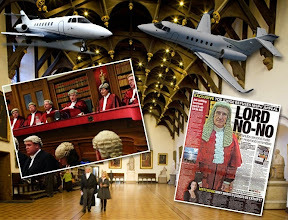 However, a legal insider at the SLCC admitted “lawyers had been expected to lie in their responses to the research”, now branded “an expensive failure & time wasting exercise”. 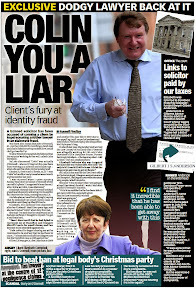 Scots law firms feel the financial squeeze while clients feel the effects of rising fees, rip offs & legal aid swindles. 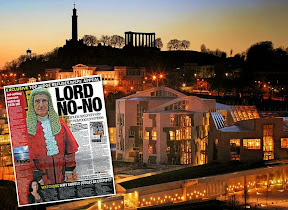 TIMES ARE TOUGH as we all know, but many clients will feel it hard to shed a tear over recent news from the Law Society of Scotland announcing that Scottish solicitors are apparently earning less cash for their greedy partners as profits take another dive at Scots law firms. 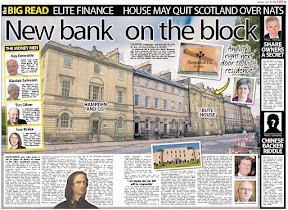 Should ordinary Scots feel sorry for a profession which writes its own rules, charges what it likes, has talked up and abused the housing market to the point of making homes unaffordable for many, has ruined families for their own financial benefit and even stolen from the dead ? Hardly. The Law Society of Scotland reported in a recent Press Release : Drop in profits shows market still tough for Scots law firms that trading conditions remain tough for solicitors' firms, despite an increase shown in profits for sole practitioners and larger firms, according to a survey commissioned by the Law Society of Scotland. The Law Society's Cost of Time survey for 2012, based on the results of 244 participating firms, showed an overall drop in profits per partner levels which are now on a par with those of 2010, with cash flow issues proving to be a particular problem for solicitors. However, while lawyers profits may be down, complaints made by clients, legal aid swindles, theft, dishonesty, embezzlement. 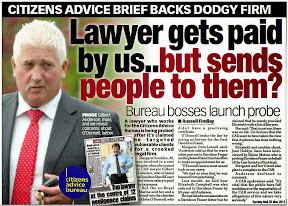 negligence and client rip-offs are unsurprisingly all on the rise as Scottish solicitors follow tried & tested methods of extorting every penny from already impoverished clients and even taxpayers & the public purse, as increasing amounts of cash greedy law firms who previously refused to offer legal aid to clients now scramble to sponge off the Scottish Government’s £160 MILLION legal aid budget. The Law Society of Scotland’s survey claimed : Median profits for equity partners in Scotland have dropped to £64,000, the same level as two years ago, following an increase in 2011. Partners in medium sized firms have seen the biggest drop, with 2-4 partner firms dropping from £75,000 to £67,000 in 2012 and 5-9 partner firms seeing a £4,000 fall to £76,000 in 2012. However the survey showed an increase of £7,000 to £53,000 on average for sole practitioners and those in 10+ partner firms have seen a rise in their per partner profits from £144,000 to £163,000. The results illustrate the extent of the difference between the profitability of larger firms with 10 or more equity sharing partners and smaller firms, with larger firms' average profit per equity partner exceeding those at smaller firms by £79,000. Equity partners in a law firm are not paid a salary, and the profits they earn are often used to fund working capital, so the figures have to be interpreted with care. The apparent paper profit is not the same as actual earnings. The research has also shown a drop in law firms' bank balances in the past year from over £200,000 last year to just over £50,000 this year for 10+ partner firms. 2-4 partner firms have seen their median bank balance fall from £27,000 to £6,000, and 5-9 partner firms have also seen a major fall. Clearly however, the reduction in law firms' bank balances and lack of cash for partners have made dishonesty, negligence and almost bare faced theft of client funds an even more tantalising way out of many law firms’ financial black holes as clients experience large fee demands for legal services which seem to have no effect on clients legal troubles. 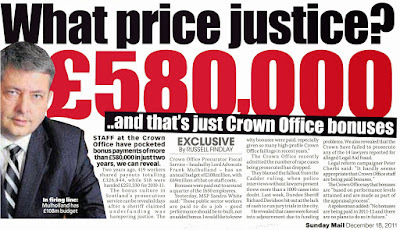 In some cases brought to the attention of Diary of Injustice, some of Edinburgh’s ‘top’ law firms are regularly charging clients well over £150 plus VAT for letters & emails which comprise only a few lines of text and many of which appear to be repeated communications, or in other words, lawyers using both email & written correspondence to inflate fees demanded from clients. In other cases, clients have been contacted by a solicitor years later, the solicitor claiming fees had not been accurately charged (in once recent case up to £30,000) and were now being demanded within seven days, otherwise the solicitor would apply to have clients sequestrated. 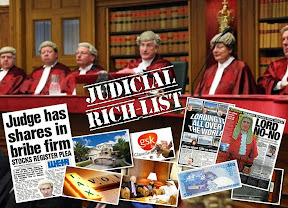 In several such cases currently being monitored by Diary of Injustice, not one of the solicitors or law firms have been able to substantiate work now being claimed for which in certain cases is claimed to date back to 2001. 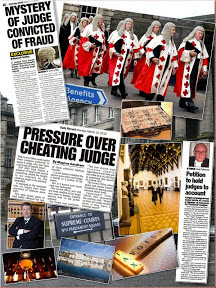 However, as Scotland’s Sheriff courts, the Court of Session and regulators such as the Law Society of Scotland & Scottish Legal Complaints Commission appear unwilling to the point of prejudice to hear out the clients side of the story, there appears to be little help for those who are now being trapped by greedy solicitors effectively demanding money with menaces which clearly are not due. 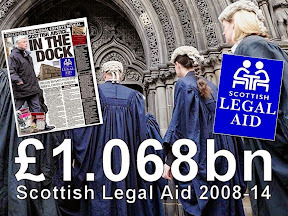 Sources within the Scottish Government have now told Diary of Injustice the Scottish Legal Aid Board have reason & increasing evidence to suspect that law firms re-entering the Legal Aid register and many currently on its books are submitting increased numbers of false claims for legal aid work on cases which are clearly going nowhere. 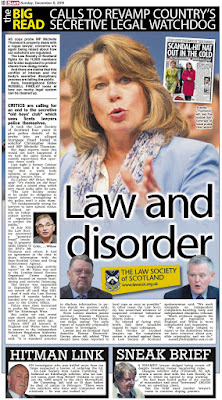 Lorna Jack, chief executive of the Law Society of Scotland, who is more used to issuing lavish claims about the size of Scotland’s legal industry, regularly putting out statements claiming a Scotland wide worth of over £1 billion pounds, told the media: "The cost of time survey is a good indicator of the general health of the profession on an annual basis and it's clear that the effects of the recession are not over.We're all well aware of tightening budgets right across the private and public sectors and we are encouraging our members to think very seriously about how they shape their business and look hard at their strengths and weaknesses to make the most of available opportunities. Ms Jack continued : "The legal services sector is, and will remain, highly competitive. We anticipate the arrival of the first licensed legal services providers in Scotland in the first half of this year and we will undoubtedly see further consolidation. As the legal market continues to change it's vital that our members make sure that they are running a tight ship and take steps to ensure that they are effective business managers as well as excellent solicitors. Our professional practice team at the Society, headed by Coral Riddell, are more than happy to provide information and advice to solicitors who want to discuss best business practice." 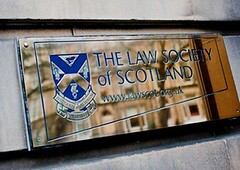 While the Law Society of Scotland has plenty of advice for law firms on how to increase their profits, there is precious little advice or help available for clients who are caught in complicated swindles masterminded by their solicitors who operate safe in the knowledge that weak self-regulation will see them escape any punishment or need to pay compensation for their wrongdoing. However, consumers can help themselves and avoid the rip offs by taking this simple advice : Let’s be honest folks, this recession is a tough one. Save your money. 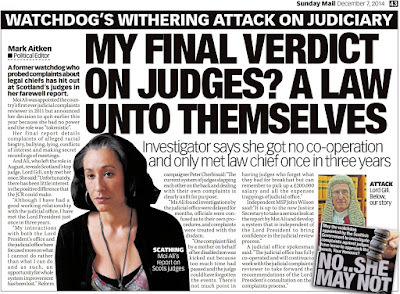 Don't feed the legal profession, feed yourself and your own family, and, if you do have problems with a solicitor, or have been forced to make a complaint about your solicitor, tell someone in the media about it.